One loves big band music and listening to the radio. The other bobs their head to hip hop and stores music on an iPod. While seniors and young people often have vastly different interests and tastes, the two together can be a welcome combination of the new and the old, and a major boost to a senior’s happiness. For senior citizens living independently, or at a facility, the presence of young people (especially grandchildren and other young relatives) can bring a smile and sense of love to seniors. 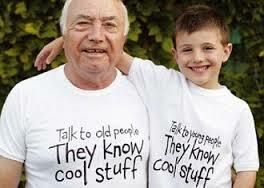 Understandably, some young people can find it difficult to strike up a conversation or find activities to do with aging grandparents, but with a little effort there’s plenty to bring the two together. 1. Date Night: Everyone loves food. Seniors and kids of all ages may be able to bond over a “date night” or day, and enjoy lunch at home or a restaurant together. Some kids may especially enjoy inviting grandma or grandpa over for a meal they helped prepare and to show them their toys or room. For seniors who have trouble with transportation, a private duty agency can schedule a caregiver within their homecare software or homecare system to drive seniors to their destination. Or, if family is coming over, scheduled light housekeeping tasks in a homecare system or homecare software, like ClearCare Online, can ensure senior’s feel they can welcome grandchildren over. 2. Social Media Sharing: More and more seniors are getting online. Older grandchildren and grandparents may get a kick out of a crash course in Facebook, or learning how to see family pictures online. While technology may often seem to keep teens and seniors worlds apart, it can also be a tool for bringing them together. Caregivers can even help by reminding seniors to send an email or message to loved ones via a technological media with a task scheduled in their homecare software. And likewise, parents can encourage kids to send an old fashioned, hand written note. 3. Gift Basket: Aging can be a lonely and isolating experience sometimes. While having caregivers using a home care system in the home can help, a visit and gift from a grandchild is like nothing else. Consider having kids put together a special gift basket. Include things like a coupon for a morning together, home baked cookies and perhaps a drawing or photograph by the child. Older kids might even consider making a special mix CD’s with some of Grandma’s favorites.